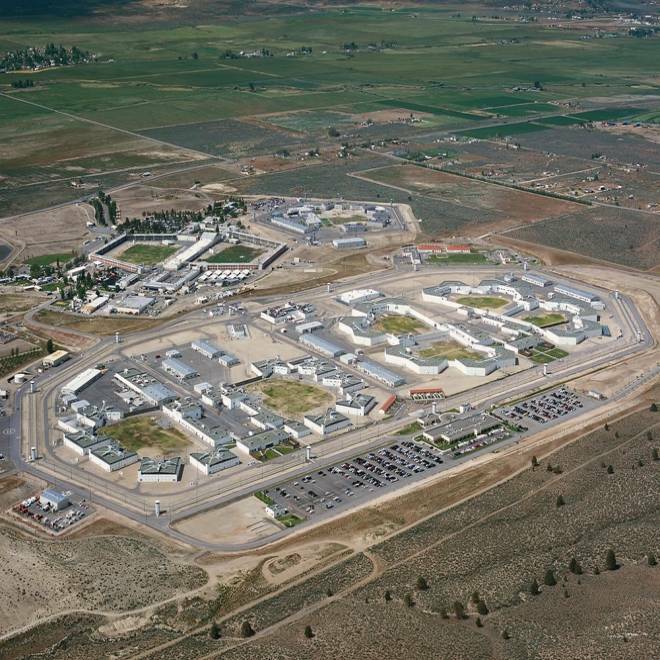 An undated handout image released by the California Department of Corrections and Rehabilitation shows the High Desert State Prison in Susanville, Calif.
Amnesty International weighed in on a 22-day-old hunger strike in California prisons on Tuesday, calling solitary confinement conditions faced by protesting inmates an "affront to human rights" and urging an impartial probe into the death of a prisoner. Billy Sell, 32, serving a life term for attempted murder, was found hanged in his cell July 22 in the "security housing unit" - for prisoners held in solitary confinement - at the Corcoran State Prison in central California. The local coroner preliminarily ruled his death a suicide by strangulation, prison officials said. They added there was no evidence that Sell's participation in the hunger strike, which the corrections department initially denied, had been a factor. 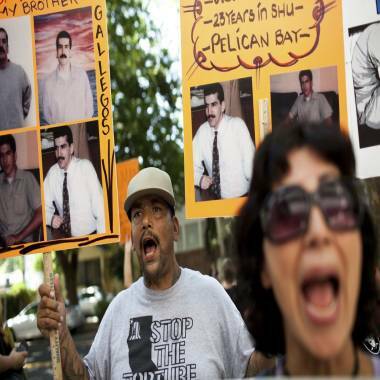 Mitchell Giovannini and Diya Cruz protest against indefinite solitary confinement in California prisons, outside the California Department of Corrections and Rehabilitation office in Sacramento, California July 30, 2013. According to inmate advocates, however, fellow prisoners reported Sell had been requesting medical attention for several days before his death, though a spokeswoman for a federal receiver overseeing state prison healthcare denied Sell was refused medical treatment. In a statement issued late on Monday, corrections officials acknowledged that Sell had been on a hunger strike from at least July 11 - by which time he already had missed nine straight meals - until July 21, the day before his death. They also said Sell was awaiting trial on murder charges and facing the death penalty if convicted in the 2007 strangulation and stabbing death of a cell mate. A source close to the corrections probe said he hung himself with a bed sheet. Several entities at the state, federal and local level are reviewing the circumstances surrounding Sell's death, which inmate advocates say was preventable and points to inhumane conditions that protesting inmates claim to suffer. The global human rights group Amnesty International joined inmate supporters from the Prisoner Hunger Strike Solidarity Coalition in calling for an independent inquiry into the death, one that is thoroughly transparent and without government ties. "Conditions for prisoners in solitary confinement in California are an affront to human rights and must end," Thenjiwe McHarris of Amnesty said in a statement. "No human being should be held under the deplorable conditions we have witnessed in California prisons for prolonged periods, even decades." Isaac Ontiveros, a spokesman for the inmate support coalition, said Sell had been in solitary for five years, adding that the United Nations "counts any day after 15 days (of isolation) as cruel and unusual punishment." "His death was absolutely preventable," he said. Corrections department spokeswoman Deborah Hoffman countered that inmate advocates "are shamelessly exploiting a man's death to mislead the public about a hunger strike orchestrated by violent gang members." More than 30,000 inmates from some two dozen California prisons began refusing food on July 8 to protest what they regard as cruel and unfair use of solitary confinement as punishment within the system. By Tuesday, the number of inmates participating in the strike had dwindled to 525 in eight prisons, corrections officials say. Strikers' principal demand has been to end a policy of keeping thousands of inmates in near or total isolation for years on end solely on the basis of alleged gang affiliations. They say the only way out of solitary confinement for many inmates is to become a gang informant, a choice that would be tantamount to signing their own death warrant. On Tuesday in Sacramento, the state capital, about 50 mothers, wives and other relatives of inmates presented Governor Jerry Brown's office with a petition bearing 41,000 signatures calling for reform of solitary confinement practices. "We're hoping the governor realizes the support that's being gained to end these types of conditions," Dolores Canales said before leading a march to Brown's office. She said her 37-year-old son has been in solitary confinement in Pelican Bay State Prison for 13 years because of his alleged gang ties. Corrections officials say nearly 3,600 inmates, or 3 percent of the state's prison population, are held in security housing units, most of them for ties to gangs, others for committing crimes while in prison. The protest comes at a challenging time for the state prison system, which houses roughly 132,800 inmates and has been ordered by a federal court to reduce its population by 10,000 prisoners this year to ease crowding.